Written on September 4, 2012 . Posted in Announcements + Updates, Events, Museum of Art, Updates from & for Faculty, Updates from the Museum of Art. A broad panorama of our country’s topographies and correlating narratives, America in View reveals a nation’s ambitions and failings, beauty and loss, politics and personal stories through about 150 photographs spanning nearly 150 years. Ranging from 19th-century albumen prints documenting the pristine drama of the Western landscape to contemporary digital images that construct newly imagined visions of post-industrial America, the show is drawn primarily from the Museum’s collection. It features objects new to the collection, including major gifts from the late landscape photographer Joe Deal (Provost and Professor) and his widow, Betsy Ruppa, as well as gifts from friends and colleagues in Deal’s honor. The show’s catalog, printed by Meridien was designed by Lucinda Hitchcock (Professor, Graphic Design) and edited by Jen Liese (Director, Writing Center). The show’s curator Jan Howard wrote the text, with contributions by Deborah Bright and Douglas Nickel. 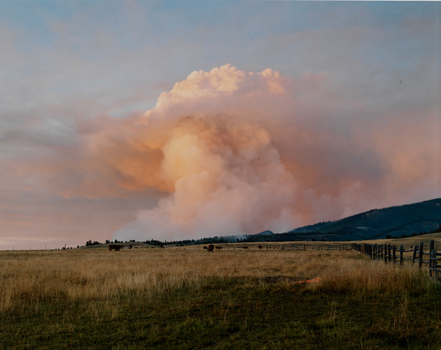 Laura McPhee, Smoke from a Wildfire Ignited by Sparks from a Burn Barrel, Champion Creek, Custer County, Idaho, 2005.